Buffalo Chicken dip is an easy classic recipe. This mouth-watering combination of chicken slathered in hot sauce, cream cheese, ranch dressing and blue cheese crumbles, pairs just perfectly with crunchy, Farmer’s Pantry Cornbread Crisps. MIX all ingredients in a large bowl. Spoon into shallow 1-quart baking dish. BAKE 20 minutes or until mixture is heated through; stir. Sprinkle with green onions, if desired. 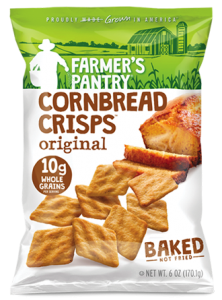 The sweet goodness of freshly-baked cornbread (with just a touch of salt) sliced into crispy crackers.